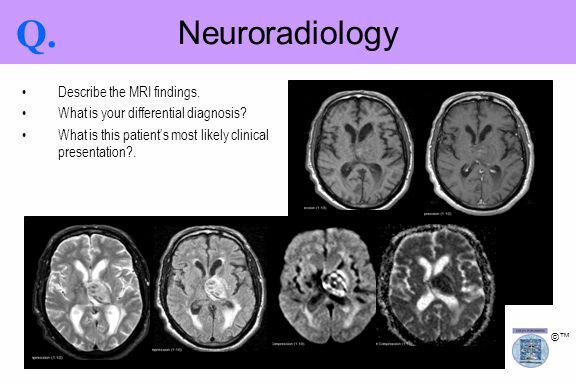 3 Q. Neuroradiology Describe the MRI findings. 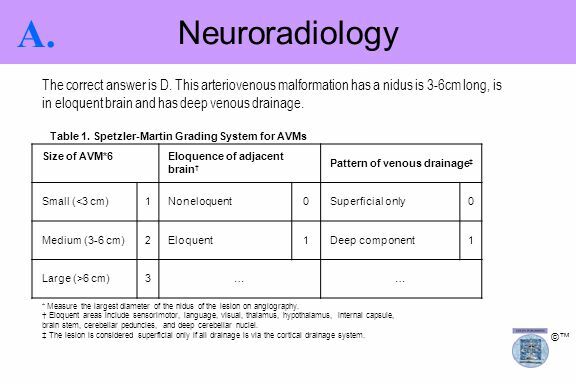 4 A. Neuroradiology Describe the MRI findings. 5 Q. Neuroradiology Basal ganglia mass continued… What are etiologies? 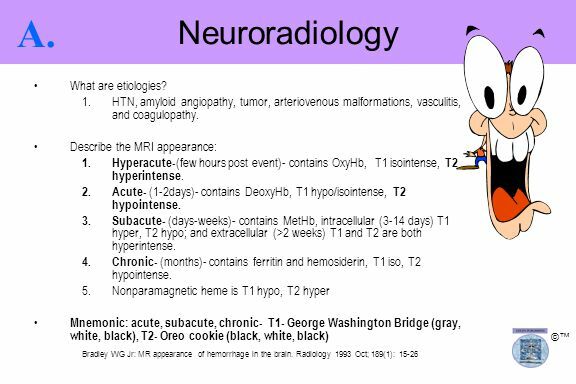 6 A. Neuroradiology What are etiologies? 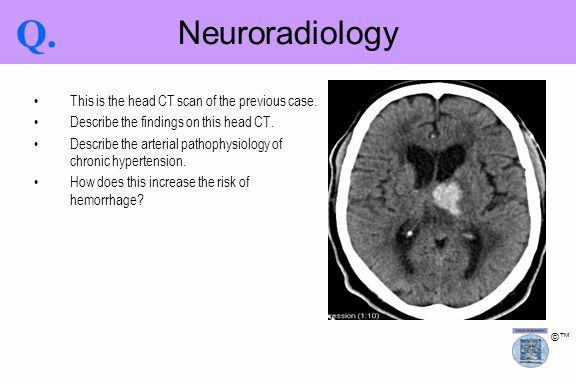 7 Q. Neuroradiology This is the head CT scan of the previous case. 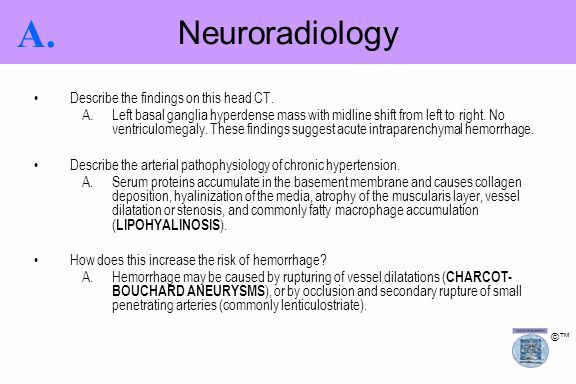 8 A. Neuroradiology Describe the findings on this head CT.
Click here ©™ Handbook of Neurosurgery and Neurology in Pediatrics; By Chaim B. Colen, MD, PhD. Download ppt "Q? 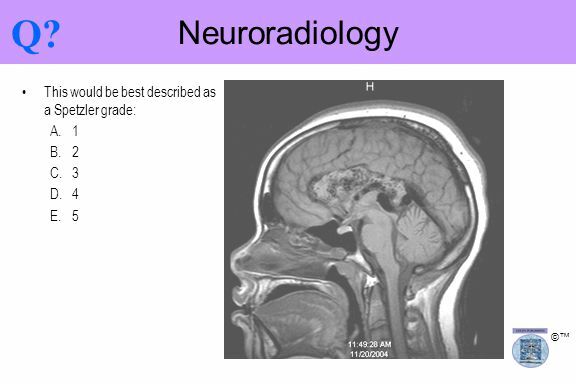 Neuroradiology This would be best described as a Spetzler grade: 1"
Radiology Slideshow CT & MRI Ian Anderson, 2007. UNC Neuro Rad/Path Conference Yueh Z. Lee, MD/PhD September 14, 2011. 67 yo Male  Clinical History: Presented to ED with left facial droop and left sided weakness Presented to ED with left facial droop and left sided weakness. 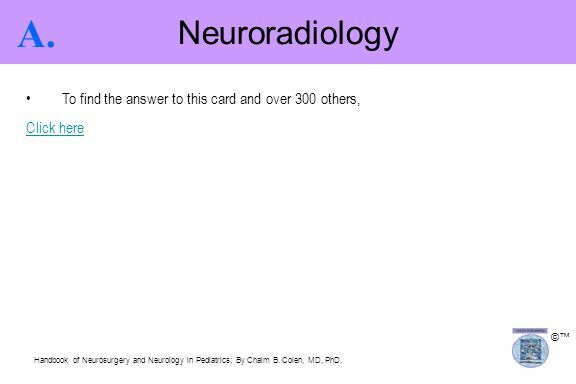 QUESTION 1: name the a) study and b) orientation Answers: A) This is a CT scan of the head B) This is in the coronal plane * The dark areas are the paranasal. The Brain Lecture 2 Ali B Alhailiy. Brain Arteriovenous Malformations in Adults Eric Johnson OHSU MS3 12/14/07 Eric Johnson OHSU MS3 12/14/07. CHLA Case Presentation. History HPI: 10 year old male with Down syndrome and a 1 week history of headache, nausea, vomiting, dizziness and unsteady gait. Hemorrhagic Stroke Dr. Grant Stotts Director, Ottawa Stroke Program. Combine conference R3 陳斯逸 /VS 孫銘希 Jan General data ID: F Male 67 y/o Farmer. 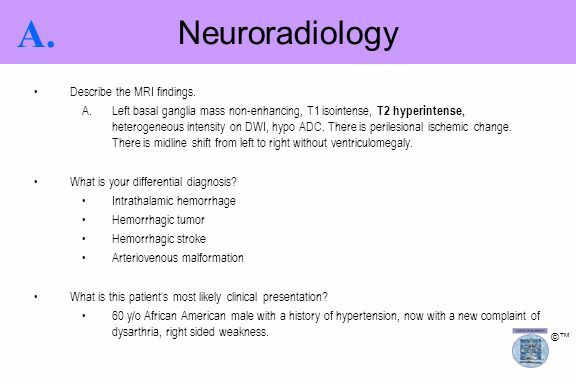 Clinical Program for Cerebrovascular Disorders Mount Sinai Medical Center Intracerebral Hemorrhage and A Comprehensive Overview of the Malignant Gliomas. 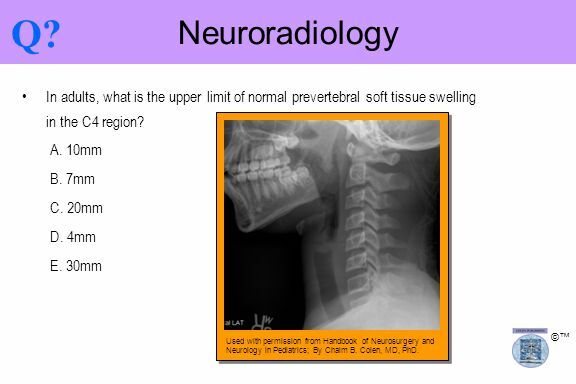 Case Report of patient RE Submitted by:Jesse M Proett, MS4 Faculty reviewer:Sandra Oldham, M.D Date accepted:29 August 2007 Radiological Category:Principal. When stroke strikes, strike the stroke. By Mikhail Serebrennik, MD Dept. of Radiology, Trinity Health.